We woke up this morning around 7:00am and I have to say that may have been the best nights of sleep I have had in quite a long time! I am sure a lot of it just has to do with the fact that I hadn’t been able to sleep lying flat in 48 hours and that I was working on about 8 hours of sleep over the past 2 days total! We got our bags reorganized and packed and went down to breakfast. 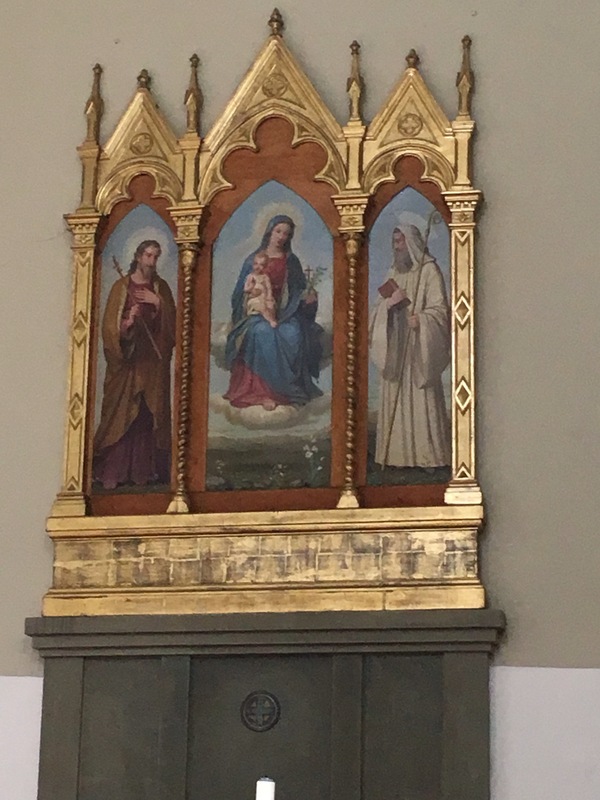 The place we are staying at in Florence is the campus where Benedictine College has their study abroad program (The Villa Morghen). Benedictine sends a professor over each semester and this semester Dr. Jeremy Sienkiwicz and his family are here. I took several of Jeremy’s theology classes while studying at BC and got to know their family very well. They were actually the reason we started planning this trip. Jeremy jokingly told me that I should come visit them while they were here. At the time I thought he was crazy, but it stayed on my mind consistently over the next few months and that is when I called Celina and the plan started into motion! Ten months later and we are actually here! Anyways – the point of that was to say that since it is predominantly Americans that live at the Villa Morgen the food tends to be more Americanized, but there are still touches of Italy thrown in! 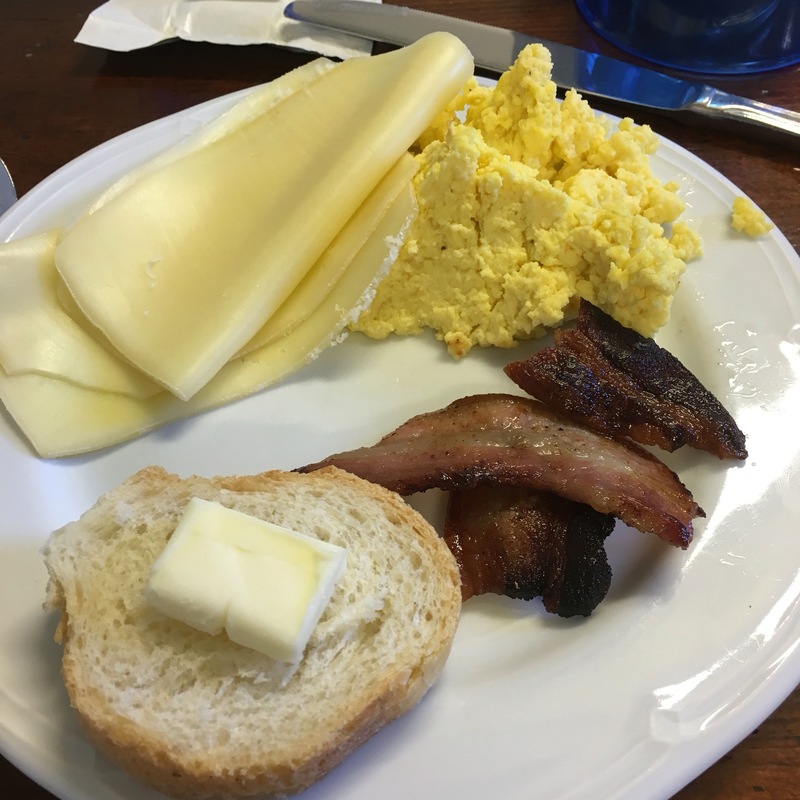 This morning it was bacon, eggs, bread, a few kinds of hot and cold cereal, cheese and various pastries. My first stop was for the coffee! Then Jeremy and the kids (Mary, Leo, Lucy and Gennivive – Jude wasn’t feeling well so he stayed behind) took us on a tour of the Villa and the town (the Villa is actually in Settignano, which is about 30 minutes outside of Florence city center) to show us the views, all I can say is WOW!! We came in last night so it was dark so we didn’t get to see much of anything, but man is it GORGEOUS here! 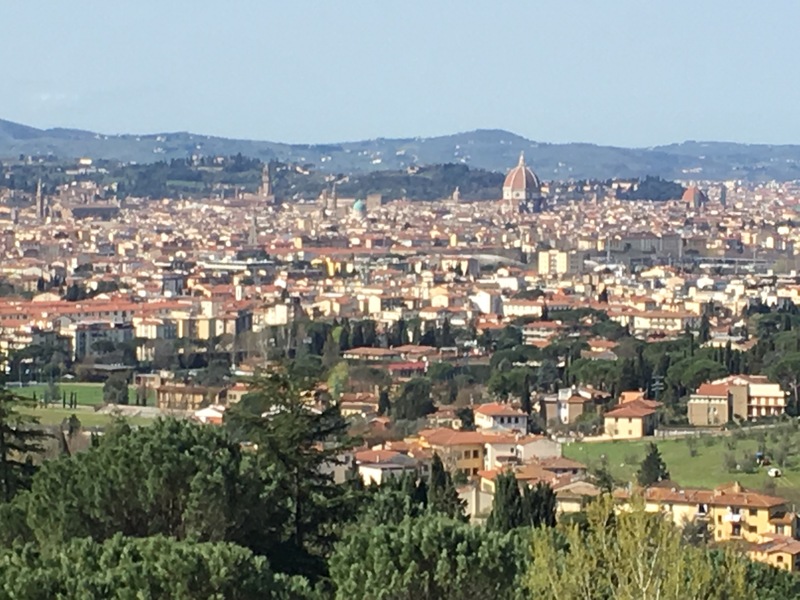 So in this photo you can see the top of the Cattedrale di Santa Maria del Fiore (The Cathedral of Saint Mary of the Flower – or as most know it “The Duomo”) which is the large dome in the center right. Just to the right of that you can see “the little duomo” which is The Basilica di San Lorenzo (Basilica of St Lawrence). The Basilica di Santo Spirito (“Basilica of the Holy Spirit”) is the left of the Duomo, it is the green dome. Continuing to move to the left you will see the Midici Palace – this is where the Midici family lived while they were in power in Florence. Finally, moving just to the left once more, you will see the Basilica di Santa Croce (Basilica of the Holy Cross). 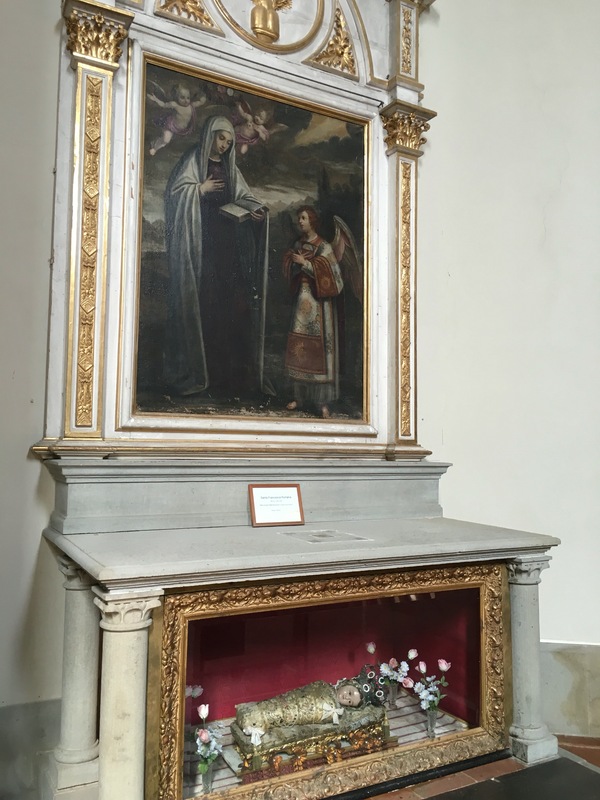 This is where many famous Italians are buried, including Dante, Galileo and Michaelangelo! We also stopped by the local parish here in Settignano. Once we got back to the Villa the Sienkiewicz family had a few things they needed to get done for school, Cathe is homeschooling the kids while they are here and Mary (their oldest) is attending a few classes with the college students – mind you Mary is only in 7th grade, but I promise you she is smarter and more mature than Celina and I combined! While they worked on that, Celina and I went back to the chapel which is inside the Villa to pray for a bit. The Villa used to be a Benedictine Monastery and the founder of this community decided to consecrate the community to the Child Virgin Mary, so instead of the black habits that you normally see Benedictine monks in, all of the images of St. Benedict show him wearing a white habit that this community wore to remind them of the purity of Mary. 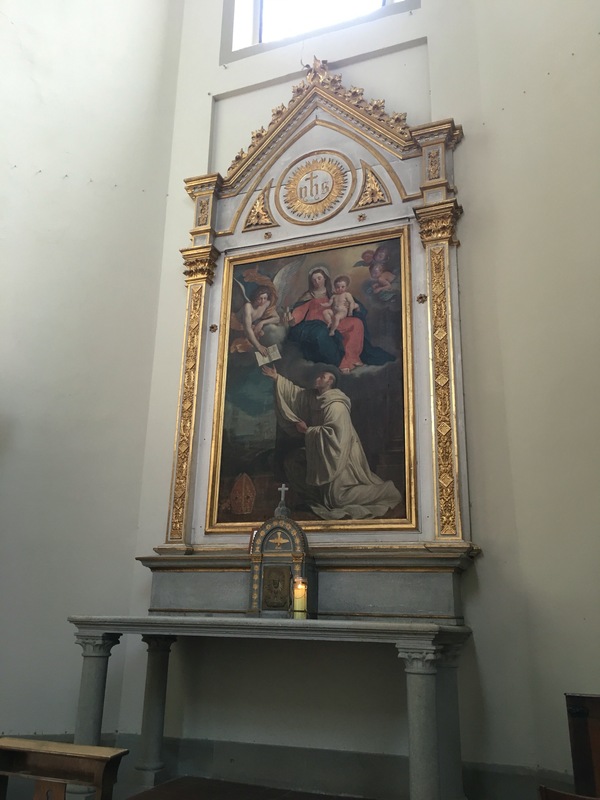 There is also an Altar dedicated to St. Frances of Rome in this chapel! After some prayer time we had lunch at the Villa. 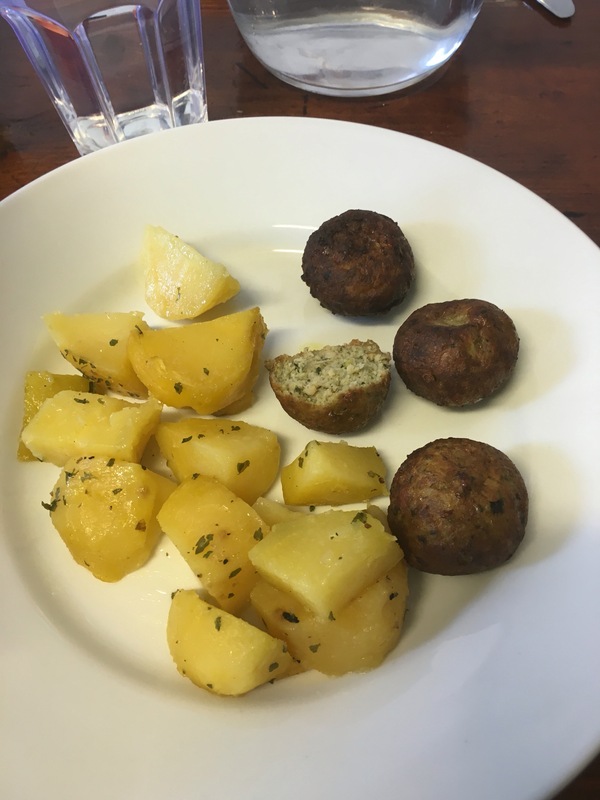 The first course was a pasta with a cream sauce, ham and peas; and the second course was meatballs and roasted potatoes. It was all delicious! Then we sat in on Jeremy’s class – they are studying the Council of Florence and so today they discussed why the council failed. It was quite interesting – it took me a few minutes to get back into the groove of being in class again, but once I did it was like riding a bike! I love learning the history behind the Church and why certain things are the way they are! The Council of Florence took place in the 1400s and was all about uniting the East and the West (the Greek Rite in the east and the Latin Rite in the west). Once class got out we grabbed our overnight bags and hopped on the bus back to the Santa Maria Novella Train Station to catch our train to Assisi. 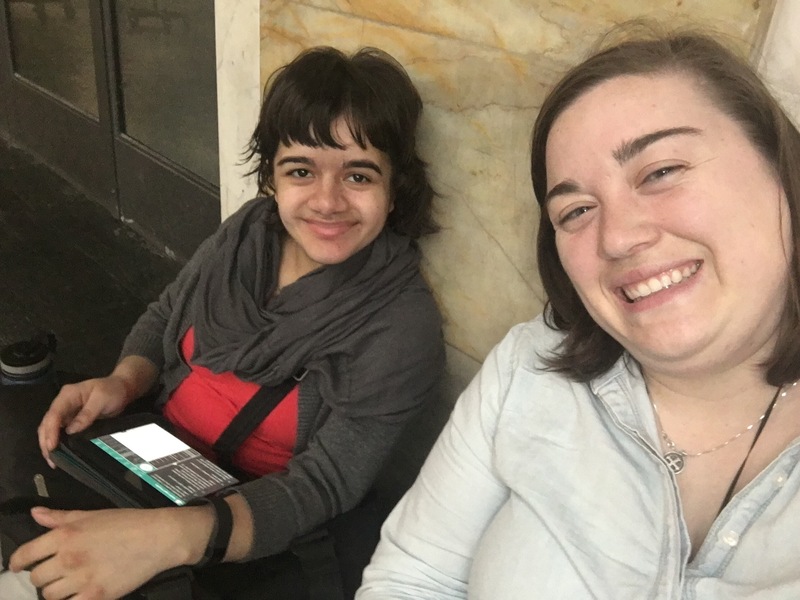 We were hoping to catch the 4:13 train but unfortunately the bus ride took a little longer than we were anticipating and we missed that train by about 10 minutes 😢. The next one didn’t leave until 6:13, so we found a cozy spot against a wall and made ourselves comfortable. Our original plan had been to get up this morning and head to Siena for the first part of the day and then go to Assisi in the afternoon. But given that we had gotten very little sleep the past two nights and since the train we were going to be taking left at 6:00 in the morning, we decided to skip Siena today and we will try and hit that later this week. It was probably a very wise decision because we really needed the sleep! Before our train took off we grabbed a bite to eat at the restaurant inside the train station, I had the Carbonara – YUM! We then hopped on the train and started toward Assisi. The ride was about 2 hours and 45 minutes long. Once we arrived we got on the Orange line bus toward San Francesco – and we timed it perfectly because the bus pulled up right as we walked out of the station. A five minute bus ride later, we got off at our stop and had a 3 minute walk to our hotel which is only 100 meters away from the Basicilia of St. Francis. We are up on top of a hill and it was SUPER windy, I thought we were going to be blown over as we were walking. Since we got into town rather late in the evening we just decided to stay in and get to bed at a decent time. It is 10:40pm and I am loving this memory foam mattress! No new saints to report on today, but I can promise that there will be PLENTY tomorrow! For those of you keeping track at home, I walked 9,231 steps today – which is 3.85 miles. It was a pretty light day as we stayed around the Villa and were on a train for most of the day! I love reading your daily blog, you do such a wonderful job with the pictures and descriptions that I feel like I am along for the ride as well! Some day aunt JoMarie hope to visit this beautiful country but until then we can experience it through your eyes. Thank you Jenna for posting you and Celina’s journeys:) We anxiously await tomorrow’s now!